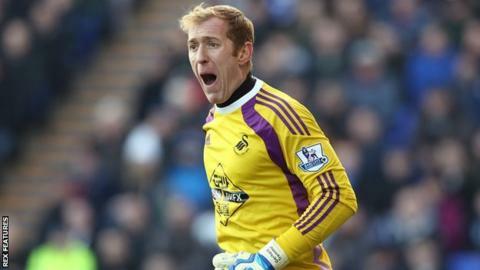 Swansea City have released eight players including goalkeeper Gerhard Tremmel and Marvin Emnes. Tremmel, 38, who joined the Swans from RB Salzburg in August 2010, made 52 senior appearances for the Welsh club, but saw action last season confined to the Football League Trophy. Emnes had two loan spells before signing a deal in 2014. He made just nine Premier League starts for Swansea. He scored four goals in 37 games on loan at Blackburn last season. Liam Shephard, Josh Vickers, Owain Jones, Tom Dyson and Tom Holland will also leave the club, while Alex Samuel has agreed to join Stevenage. Youngsters Causso Darame and Mael Davies have signed new deals while striker Jordan Garrick, goalkeeper Lewis Thomas and full-back Aaron Lewis, have all been offered extensions.